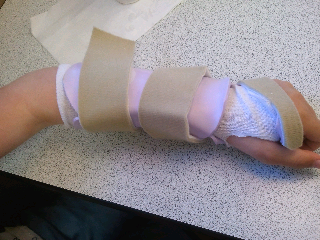 Today I got permission from David to post pictures of his broken arm. 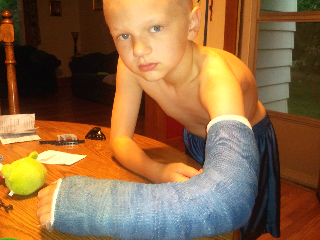 So far he has had a gigantic blue cast for 4 weeks. This cast could not get wet and required a sling to hold in place. 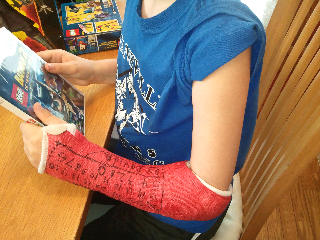 Then David got a much smaller, red, fiberglass, waterproof cast. This one he wore for 4 weeks. Now today he was fitted for a splint. This one is custom built for his arm and purple in color. He will have to wear the splint for 3-4 more weeks. It has been a long road. David has taken it like a champ. So proud of his attitude.